With Christmas just around the corner (next week - YIKES!) I thought it would be helpful to reflect on last years gifts & see which ones are still being played with and which ones just never made the cut with the lil divas! Aside from the toys in my previous Winning Toys post I have a few more Leapfrog learning toys that are regularly played with and which I also love for their educational value! First, is the Phonics Radio which is unfortunately not widely available at this time! The name is a bit misleading because it's not really a radio in the way you might expect. It does play a few nursery songs but mainly it's a phonics radio. The "radio" has 30 songs, rhymes and a mystery tune game that lets children explore letter names, sounds and letter/object correlation. The Lil Divas love how encouraging DJ Leap is when they get the answer right! I like that it's not loud and obnoxious, the songs are catchy and they are learning while playing. This little toy is also sturdy, it has survived numerous bangs and falls and still works like when we first opened it. The Lil Divas love singing along with their Phonics Radio! Text and Learn makes the lil divas feel like they have their very own smartphone. The Divas exchange text messages with Scout, check Scout's planner to see what his plans for the week are, practice letter matching, shape identification and even familiarize themselves with a real QWERTY keyboard! They love the silly sounds and animations and I of course love that they can explore letter names and sounds, reinforce shapes and learn actual keyboarding which is essential these days! This one was not their go to toy. I think it was due to the fact that it lacks flash (i.e. lights). It's more simple/basic and is not loud or obnoxious. I liked that about it but the Divas love loud & flashy and so this just did not get their attention like the other toys did. There were a few things I really liked about the Alphabet Explorer. One was that it is that is very easy to understand. The voice and pronunciations are extremely clear which is especially great in the letter sounds mode. I find some of these electronic toys hard to understand and you almost have to guess at what the voice is saying. Not this one! Another thing I liked was that it helps with both letter recognition and sounds. There is a fun game where the child is given a letter name or sound and they have to press the correct letter. Overall, I think this is a good early learning toy and it definitely served it's purpose while we owned it. Thanks for the tips! Saw "Text and Learn" the other day and almost got it for Isa. 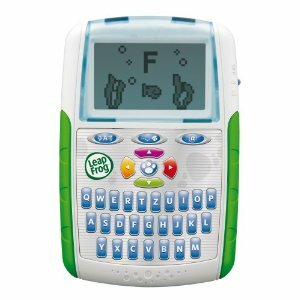 I saw another one that seemed interesting, also by Leap Frog, that is similar to this one, but allows the child to practice writing letters (even though I'm not sure whether or not it shows proper letter formation). Again, loving your posts and the great tips! The Scribble & Write? I actually want to get that for Jas, we have one I purchased last year from VTech but it does not do proper formation for some of the letters & that is a pet peeve of mine! I do not like that when she does it the way I have been teaching her (the Zaner-Bloser manuscript way) it acts as if she is wrong and this has been frustrating for her (and me as well)! I have heard good things about the Scribble & Write overall! 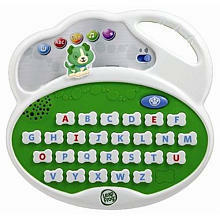 She enjoys the VTech toy so I know she would like Scribble & Write and I'm hoping it has better letter formation! I have been looking into it - will be sure to let you know what I find!